During my travels I often see monuments built to remember and celebrate events that have marked the history of the countries and their people. These monuments can be about freedom from colonialism, freedom from despots and oppressive regimes, finding a safe sanctuary where their families can live with dignity and hopes for peace. This post is about such monuments from different parts of the world. 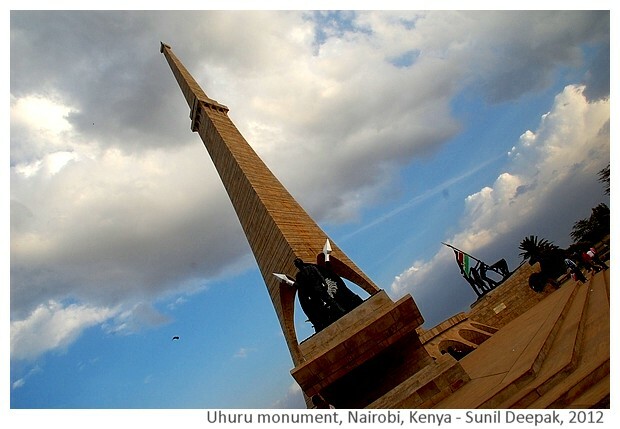 The Uhuru monument (Freedom monument) from Nairobi, Kenya (Africa) shown in the picture above is a good example of what makes the freedom monuments. Usually it has freedom fighters, national flag, common men and women of the country and symbols expressing hopes for peace and prosperity. Most such monuments have some of these elements. In this photo-essay, I have taken the significance of "freedom" in a wider sense, and thus, the events represented in this post are very different. We may not even consider all of them as "freedoms", some could even be monuments made by regimes to showcase false freedoms that are missing from their daily realities. This post is the second part of a photo-essay that had focused on war monuments. With this brief introduction, lets start with liberty monuments from Africa. 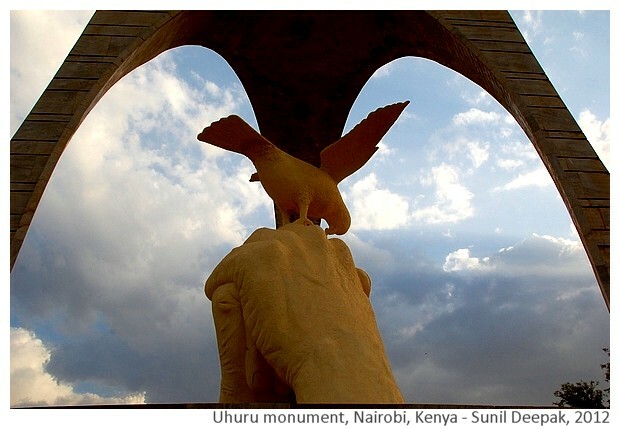 The image below shows another part of the Uhuru monument in Nairobi (Kenya) where the dove symbolizes the desire of the people for peace and prosperity. The Uhuru monument celebrates the freedom of Kanya from the colonial rule. The image below is from Robben Island in Cape Town (South Africa) where Nelson Mandela was imprisoned for 27 years. 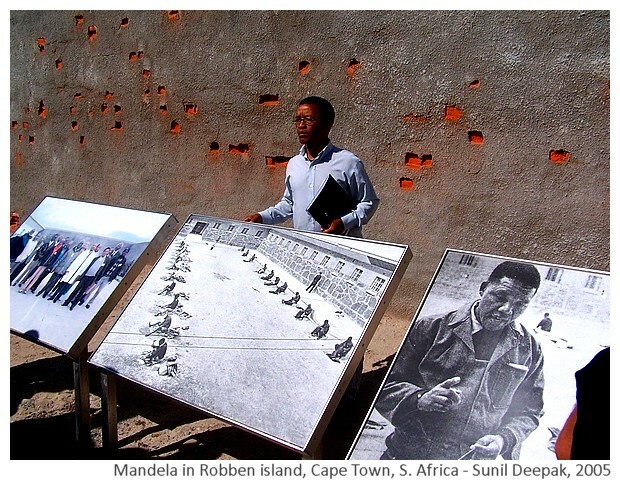 It was taken in the courtyard where Mandela used to break stones, shown in the central picture in this image. Mandela is a symbol of freedom from tyrannies and injustices through peaceful protests, along the path of non-violence shown by Mahatma Gandhi. 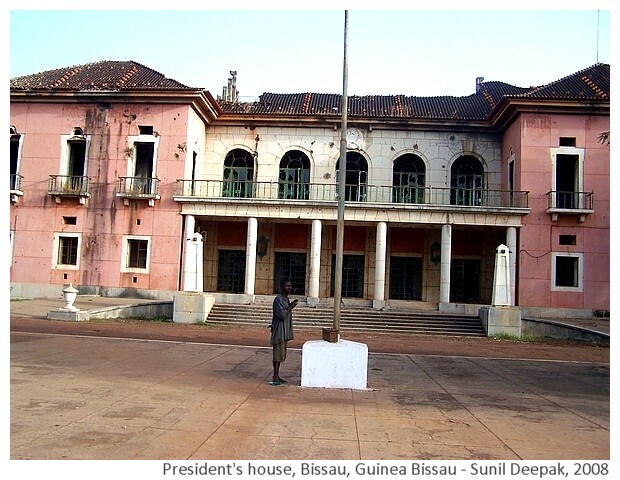 The next image is of the President's house from Bissau (Guinea Bissau) in west Africa. The house was damaged during the military coup followed by a civil war that took place in Guinea Bissau around 1998. 10 years later the house still showed the signs of the war and was abandoned, though a fragile democracy had returned to the country. Guinea Bissau had won freedom from colonialism in the 1970s. It seemed that some of its islands had become a convenient transit point to manage drugs towards Europe, with the complicity of some military persons. For me, this building in Bissau was a symbol of difficulties of finding peace and freedom for the people, when more powerful interests prefer to continue wars and poverty. Thus it is not a real freedom monument but a symbols about its absence. The two monuments from the Middle East in this post are both from Palestine. 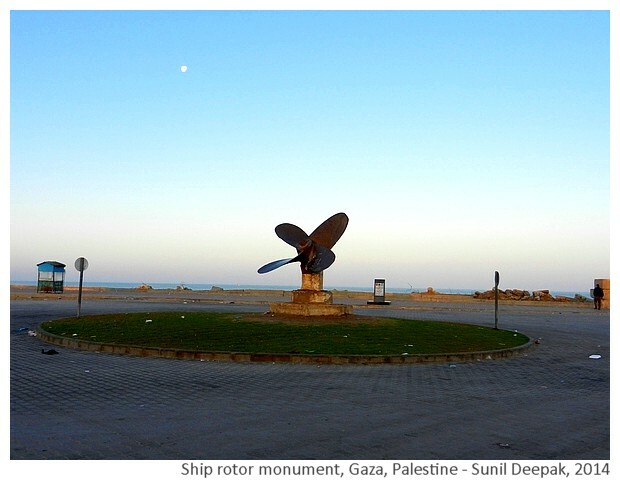 The first one shows the rotor blades of a ship that had tried to force its way through the Israeli blockade of the sea around Gaza. For me it symbolizes the continuing struggle of Palestinian people for their freedom. 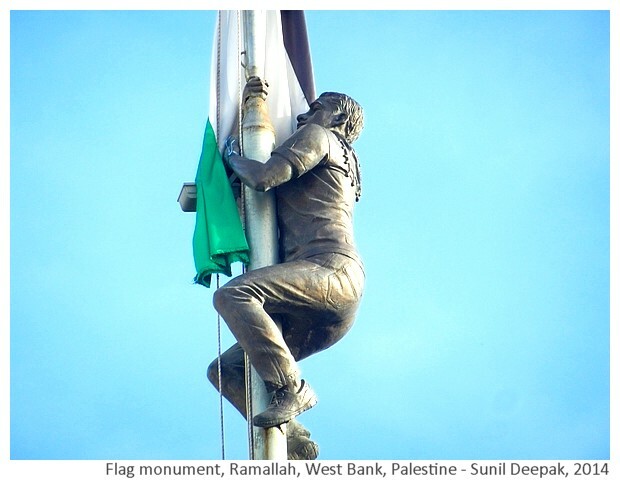 The second image from Palestine is of the flag monument from Ramallah in the West Bank showing a boy climbing a pole to hoist the Palestinian flag. While the Palestinians fight for their liberty from the Israeli occupation, some parts of Palestine also seem to be going towards a more conservative version of Islam, that curtails the civic liberties, especially of the women and minority groups like gays and lesbians. Thus the fight for freedom, peace and dignity can be seen at different levels - against others and also against our own societies. I have selected three images of the freedom monuments from India. 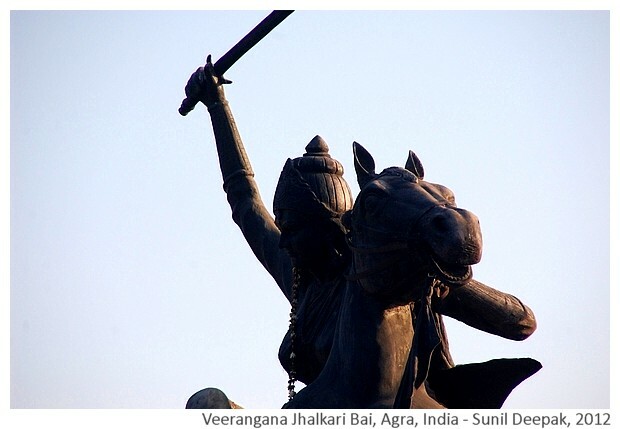 The first one shows a statue of Veeranga Jhalkari Bai from Jhansi during the war with the British in 1857. I like this image for different reasons - first of all, because it represents an ordinary soldier. Most of the recorded history is about kings and queens and India is no different. Thus, when history mentions the Indian freedom fight of 1857, it is mostly about nobles and royals like Laxmi Bai and Nana Saheb. Jhalkari Bai had dressed up as the queen during the war, allowing the real queen (Rani Laxmi Bai) to escape. Another aspect of the 1857 freedom fight is about who wins the war and writes the history. Thus, while Indians talk of the 1857 war as their freedom struggle from the British, British historians call it "mutiny" or "rebellion". 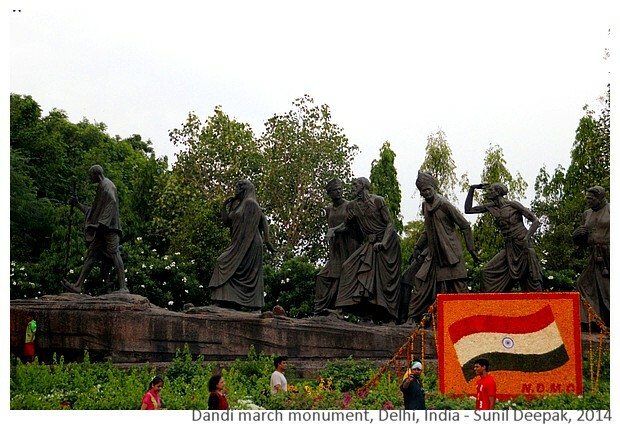 The second image from India is of the monument depicting Mahatma Gandhi's Dandi march in 1930, when he had launched the protest against the British by challenging their law that prohibited Indians from making the salt. It was a key event in India's freedom struggle and it brought common persons into active protest against the British. This monument is in New Delhi. 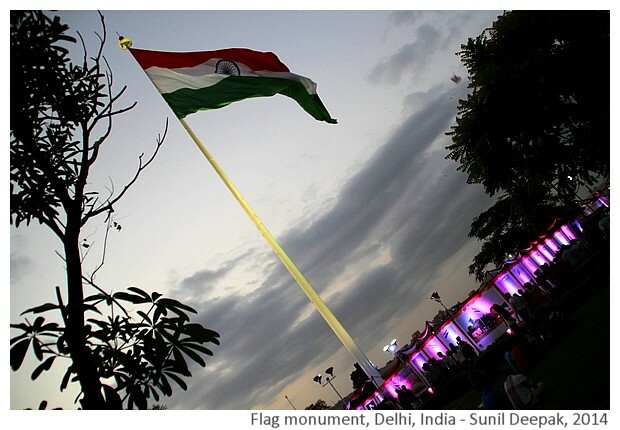 The third image of freedom monuments from India is again from New Delhi - a 27 metres (60 feet) long national flag on a a 63 metres (207 feet) high pole in the central park of Connaught Place was placed in March 2014, and has quickly become one of the most photographed monuments of Delhi. 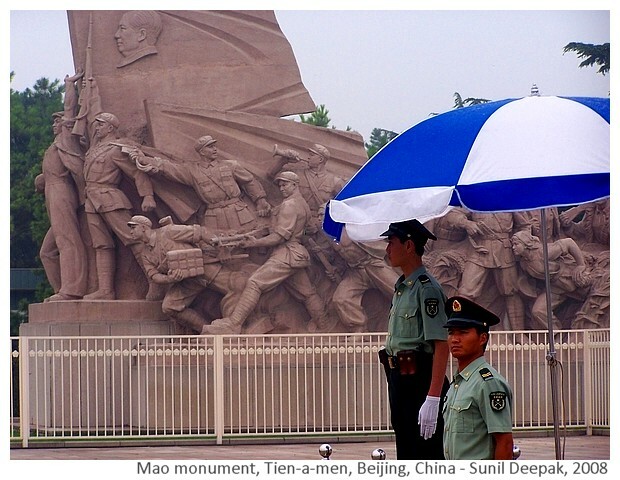 The next freedom monument is from Tien-a-men square in Beijing, showing China's war against the nationalist forces and the role of chairman Mao Tse Tung in shaping the destiny of the country. Reading the history of events in late 1950s and early 1960s, including the personal testimonies of persons affected by it, Mao's Cultural Revolution led to freedom of the peasants and atrocities against its thinkers, artists and philosophers. Thus, we can discuss if that event and the monument representing it can be called a "freedom monument" but without doubt, it was a period that had a profound impact on the lives of millions of persons. 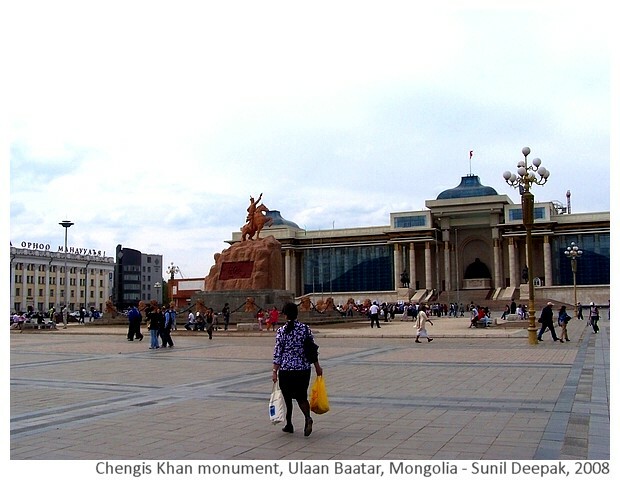 The next image is from the Parliament square in Ulaan Baator in Mongolia showing the monument to Changis Khan, considered a symbol of national pride. Thus persons symbolising national pride and freedom in one country, can also be seen as oppressors or invaders by other countries. The next two images are from Manila in Philippines. 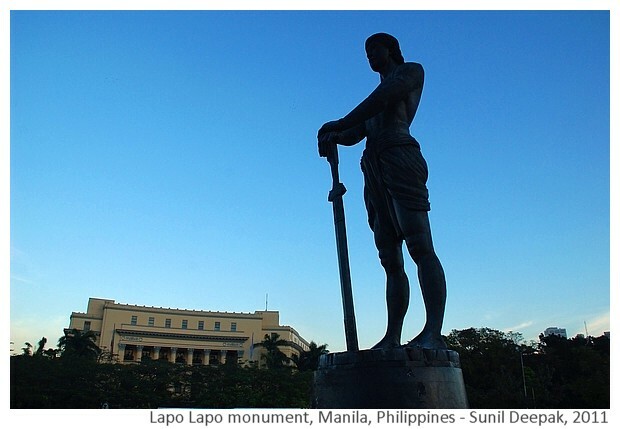 The first image shows Lapo Lapo, an indigenous leader who is considered the first freedom fighter for the liberation of Philippines from colonialism. 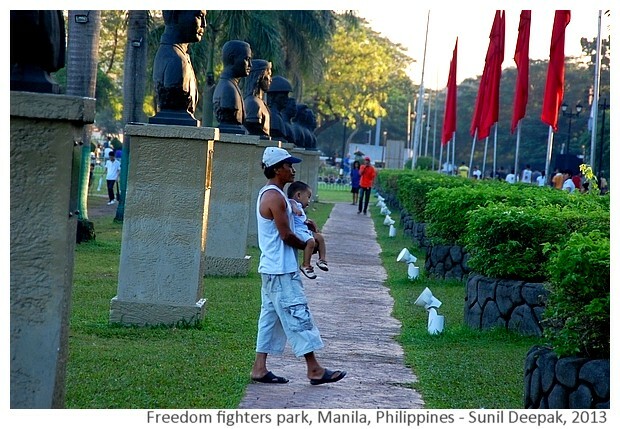 The second image from Philippines is from a park in central Manila where statues of different leaders who played an important role in the liberation struggle and building up of the nation, are displayed. 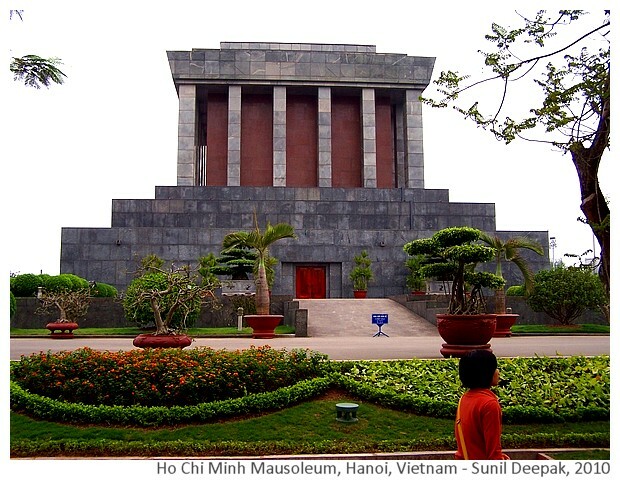 The last image from Asia is from Vietnam - the Ho Chi Minh mausoleum in Hanoi. On one hand, the fight between south Vietnam supported by USA against the communist regime in north Vietnam, was supposedly for freedom from communism. But for the Vietnamese, it was the fight for freedom of a small country against the mighty forces of a powerful nation. For most of twentieth century, the overt and covert wars waged by USA with support from its Western allies against communists regimes, were usually waged as "wars for freedom". On the other hand, the communist regimes justified the curtailing of civic liberties to liberate the poor peasants from the oppression of their own rich classes, sometimes leading to immense disasters as in Cambodia. Those kinds of wars have become less important in the recent histories because even communist regimes have embraced capitalism. Only future will tell if these changes will lead to real freedoms for people or they will only substitute oppressors, equally ruthless against the poor persons and their environments in their quest for profits. The next 3 images are from New York in USA. 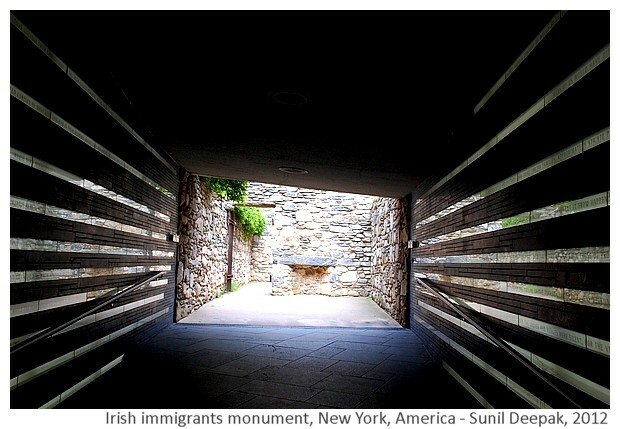 The first monument is the Irish Hunger monument from the Battery park, that remembers the journey of thousands of Irish immigrants to USA to escape the great famine in Ireland between 1847 to 1852. 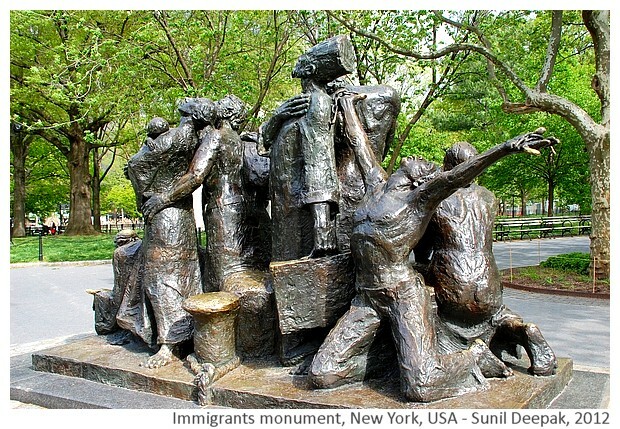 The second image is of the Immigrants monument that expresses the feeling of freedom among the immigrants from different parts of the world on reaching the American shores. I have preferred to show this rather than the better known "Statue of liberty" to talk about immigration and freedom. Every years, hundreds of thousands of persons try to escape from oppressive regimes or from poverty, to more developed countries. On the other hand, the receiving countries almost always look at these immigrants as "problems" and try to block their entry. Every month, hundreds of people die trying to cross from Mexico to USA or from North Africa to Europe. "Illegal" immigrants are considered a problem in many parts of the world, including in India, and thus it is not easy to find monuments celebrating the immigrants. 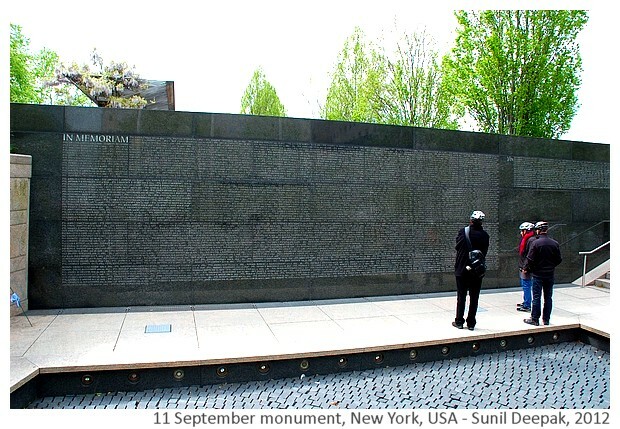 The third image from New york is of the monument to the people who had died in the September 11 attacks in 2001. Increasingly terrorism and killing of civilians is an increasing problem in different parts of the world and it is rare to find monuments remembering the victims of such attacks. When faced with relentless oppression by a powerful regime, some times people justify terrorism, and say that terrorism is a "freedom struggle" of those without power. Personally I do not agree with this view point - I feel terrorism and killing of civilians can never be justified because blood baths never lead to justice and peace, they only lead to a different group of oppressors. The next 3 images are about persons who played an important role in the liberation of countries in South and central Americas but these monuments are from New York (USA). 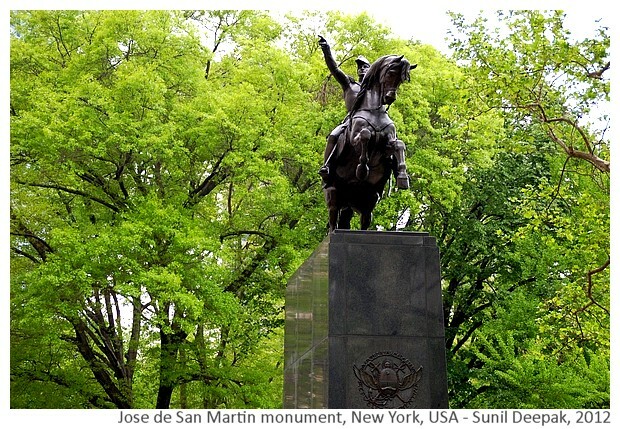 The first monument is to Jose de San Martin who played an important role in the freedom of Argentina from the Spanish colonialism. 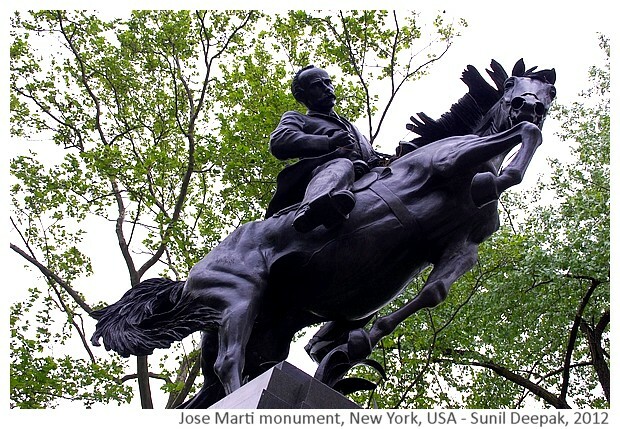 The next monument shows Jose Marti Perez, a national hero from Cuba, who was a poet, journalist and revolutionary philosopher. 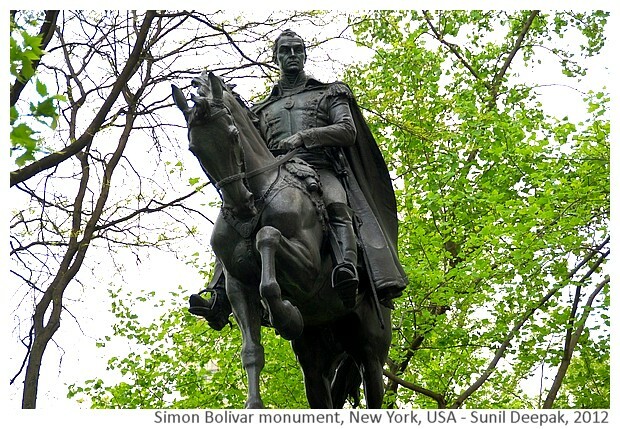 The third image from New York is of the Simon Bolivar monument, who is considered a national hero in many countries of Latin America including Venezuela, Colombia, Panama, Bolivia, Peru and Ecuador. The next three images are from Brazil in South America. 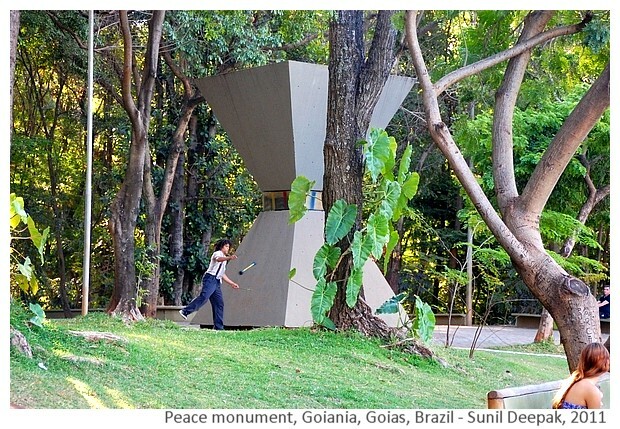 The first image shows the peace monument in Goiania (Goias) that is an hour-glass shaped construction carrying small pieces of earth from different countries of the world. 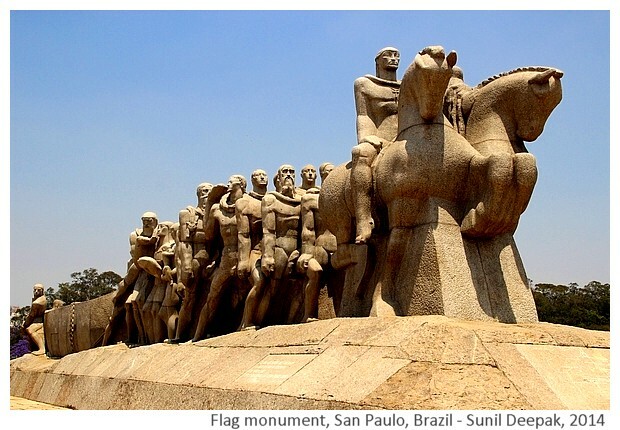 The next image shows the Flag monument from San Paulo in Brazil, built to celebrate 4th century of foundation of San Paulo city. To me, this monument also symbolizes the power of time to cancel part of our unpleasant memories - if we think of the Amerindian people living in Brazil before the arrival of colonialists and of the African slaves brought by them, we can also see it as a monument to remember the killing of Amerindians and slavery. 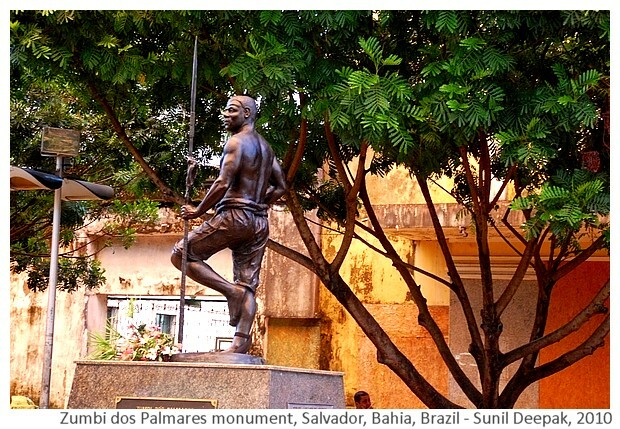 The third image is from Salvador in Bahia state of Brazil and presents the monument remembering Zumbi dos Palmares, a slave brought from Africa who led the rebellion against the colonialists. 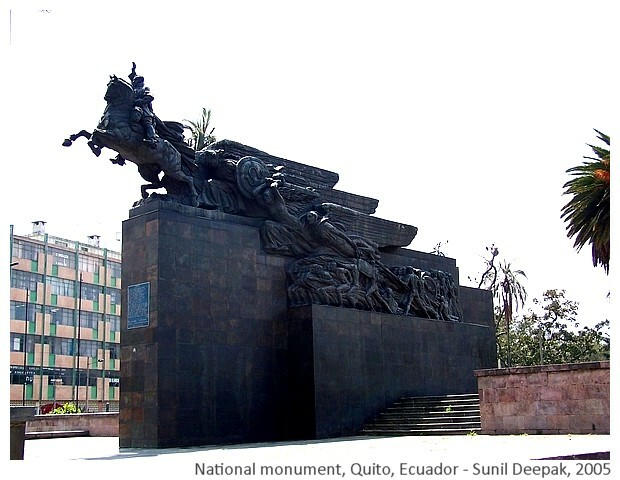 The last image from the Americas is from Quito in Ecuador, presenting the national monument, expressing the subjugation of natives under the colonial rule. Different European countries were responsible for the colonialism in Asia, Africa and the Americas. However, many of them also had histories of their own struggles for freedom. 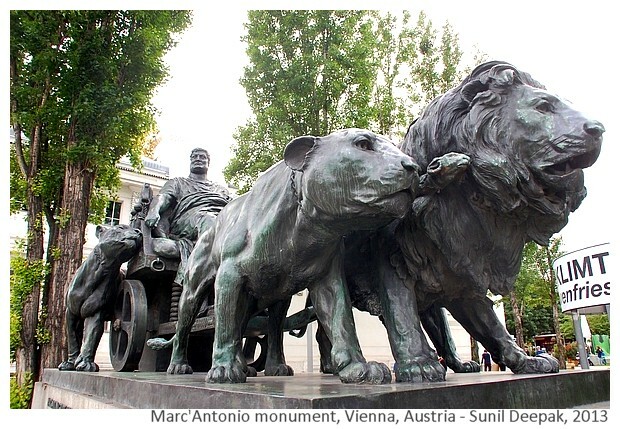 The first image in this section is from Vienna in Austria and shows the Roman general Marc Antony riding a chariot pulled by lions. A commander of Julius Caesar, Antony became the ruler of eastern provinces of Roman empire and had an affair with the Egyptian queen Cleopatra. Thus, this monument is not about freedom but about empire building and shows that the struggles for freedom have a very long history. The next 3 images are about the changes in Eastern Europe over the past 2 decades. 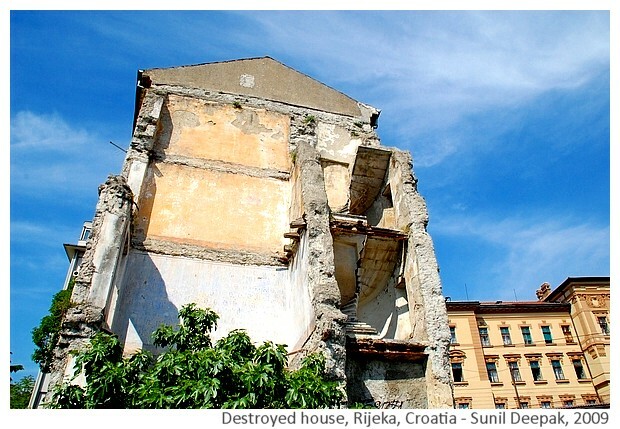 The first image is of a ruined house from Rijke in Croatia, that can be considered as a symbol of the different wars that characterized the breaking up of Yugoslavia. 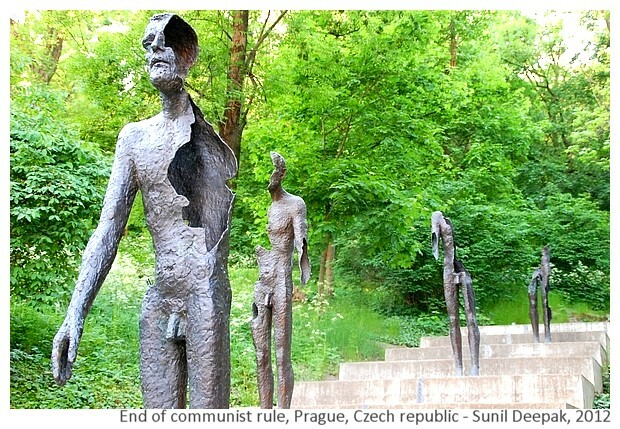 The next image is from Prague in Czech republic and shows the monument of the victims of the communist regime. 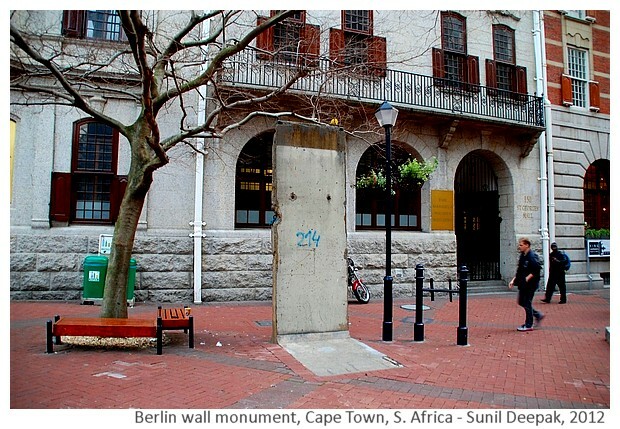 The third image regarding Eastern Europe has a piece of the Berlin wall displayed in Cape Town in South Africa. 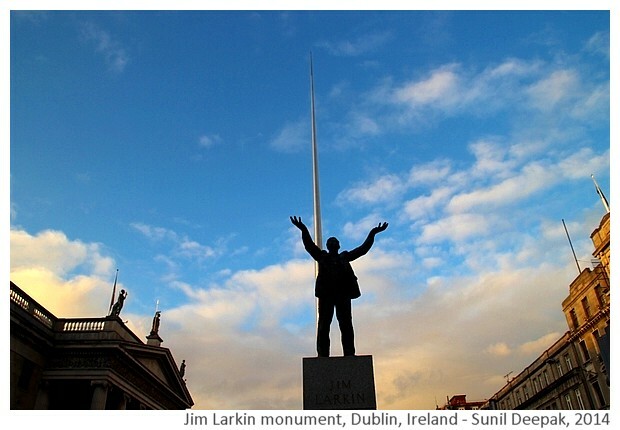 The next image is from Dublin in Ireland and shows the statue of Jim Larkin, a Trade Union leader. During the twentieth century, trade unions played an important role in promoting freedoms by improving the lives of factory workers. The recent years have seen a dismantling of trade unions in different parts of the world under the impact of globalization and corporate capitalism. At the same time, in some countries, the trade unions are no longer representing informal or irregular workers, but are seen as safeguarding the interests of those who already have good jobs. 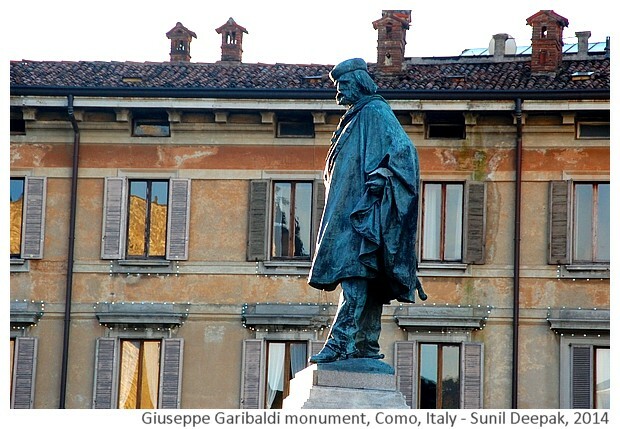 The last image of this post is from Como in Italy and shows a statue of Giuseppe Garibaldi, who was instrumental in unification of Italy in the nineteenth century. The monuments to freedom, peace and dignity come in different shapes and sizes. Sometimes the ideas they represent are more complex and can even be seen as monuments to injustices, massacres and oppression. A key event missing from the images in this photo-essay is that of a holocaust memorial. On the other hand, our cities can present us living monuments of how our freedoms are often under attack. For example, these monuments do not talk about women - the violence against women, their genital mutilation, the abortion of female embryos, forcing women to wear burkas and cover their bodies in the name of religion or traditions. These monuments also do not talk about indigenous people fighting for their rights, being displaced from their homes without proper compensation or rehabilitation. Mesmerizing...soothing effect it generated while reading.